"The apple sweet crunch that's sweet to munch." This cereal has been described on the box as a "naturally sweetened whole grain oat & corn cereal." In the early 90's, the box also noted that is was "made with real apples." Many television commercials during this cereal's early days told consumers to "listen to the apple sweet crunch of a whole new O." One television commercial, possibly from 1991, featured two characters name Apple and Cinna-man whose job it was to save the cereal's apple and cinnamon sprinkles from bad guys. This ad was unique in that there's no mention of sprinkles in any other advertising we've found for this cereal. "The apples and the cinnamon taste better... It's baked in... I taste apples... cinnamon... and brown sugar... It's baked in. 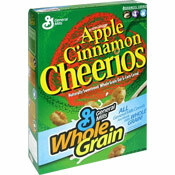 Now Apple Cinnamon Cheerios taste even better because it has a baked in apple cinnamon taste." What do you think of Apple Cinnamon Cheerios? View all 16 comments for this cereal. 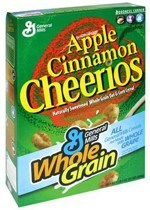 I bought a box of Apple Cinnamon Cheerios at Hy-Vee west in Norfolk, Nebraska. The greatest cereal. I love them Apple Cinnamon Cheerios. It's such a great Cheerios cereal! Because it has a sweet taste of apples and cinnamon! 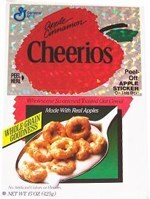 I used to love the original Apple Cinnamon Cheerios from the 80's. They used to have the little apple pieces coated onto the Cheerios. They were so good. But for some reason, they took the apple pieces off of the Cheerios sometime in the 2000's. Now I notice Apply Jacks has the same type of apple pieces on their cereal like Cheerios used to have. It's okay. Not the best. This has been my favorite cereal for years! To my dismay, the local supermarkets have quit stocking it (Delaware). Have the Cheerios folks stopped making it or is just not available in this area? This has been my favorite cereal every since I first got to eat cereal. I've gone through one box a month for the last 20 years. I hope they never stop making it. I'd be totally lost. Apple Cinnamon Cheerios forever! OMG!!! Delicious cinnamonyyy and the milk taste great but I cant find it in Egypt! I wish we still have it!! This cereal leaves some of the tastiest milk there is when you're done with it. Anybody besides me wish they'd sell cereal-flavored milk in bottles? How great would *THAT* be, eh? Like Cinnamon Toast Crunch milk, Peanut-Butter-Puff milk... Agghhhhh... Such deliciousness would tear a hole in the space/time continuum. Just okay is an appropriate characterization. The taste isn't bad but it is too sweet for my taste buds. It does not hold a candle to the original.